I have no issues with North America’s collective love affair with s’mores. In fact, I can overlook all the uncomfortable nuisance of sitting around a campfire just for the experience of toasting a perfectly golden molten marshmallow. I have skills, you know. What doesn’t get me excited is graham cracker. 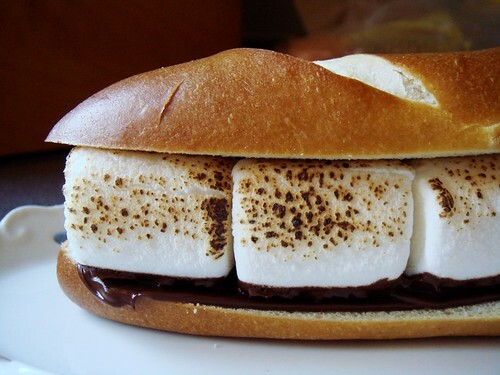 It is the weakest link in the s’mores trifecta, easily outshined by melting chocolate and gooey smoky marshmallow. It can barely fulfill its responsibility as delivery vehicle. Something needs to be done. It’s no secret that I love pretzels in all shapes and forms. When I saw that President’s Choice introduced mini soft pretzel rolls this summer, I snapped up a bag with no second thought. I suspect most people would fill it with grilled sausages but I immediately imagined its potential to elevate s’mores. With crispy crust and soft warm crumb, the pretzel roll would add just the right touch of contrast to chocolate and marshmallows. I think you can tell a lot about me by looking at some of my prized belongings. If my wardrobe is a personal statement of how I present myself to the world, then my tableware is a reflection of me at my most comfortable. While you may not see me all decked out in floral and lace, I do have a weakness for pretty things. There is a girly side of me that is not apparent when you see me as an athlete. It’s definitely there though, often when I’m lounging at home. Baking can take inspiration from many places and last week I was inspired to showcase my latest favourite cups and bowls and plates. Since I brought these beauties home from Europe, I’ve been using them everyday! Just looking at them on my dinner table elevates even a dreary supper into something festive. I’ve always wanted lace-edge plates for no other reason than threading the edge with colourful ribbons. Silly and impractical but oh-so-pretty. This off-kilter red organza bow on the white plate makes me think of Hello Kitty which in turn inspired this Raspberry Almond Yogurt Cake. 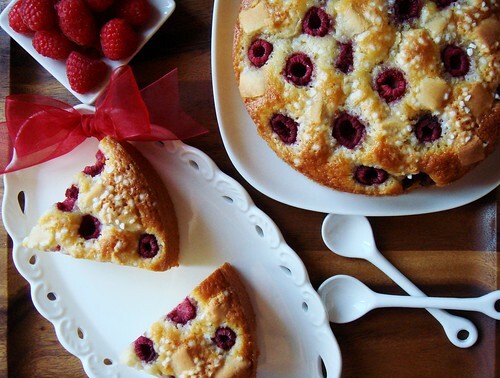 The classic French yogurt cake got a girly makeover with ground almond, bits of almond paste, juicy fresh raspberries, and Swedish pearl sugar. 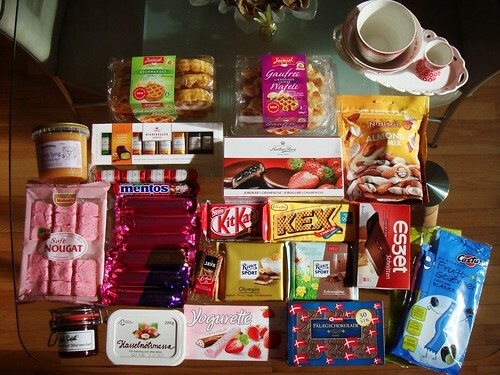 I’m ready for a tea party! Showing off pretty bowls and plates must wait because I made a treat last night that would be most appropriate for the upcoming Memorial Day long weekend. May long weekend is the unofficial kick off for summer. For us Canadians, that would be Victoria Day the previous week. We clamour for sunny days, relaxing alfresco meals in the backyard, and a cold drink in one hand. 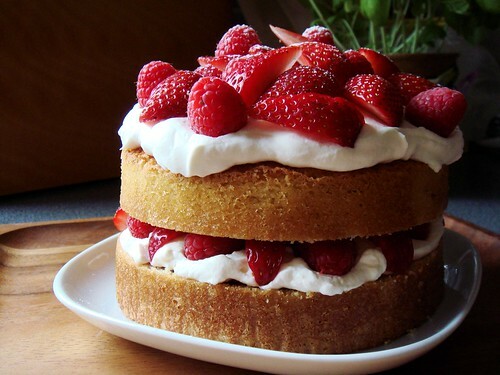 This is also the perfect time to enjoy strawberry shortcakes. This time last year, I weighed in on two different styles of strawberry shortcakes. As much as I love the biscuit-style, it may not be the easiest to prepare for a big crowd because the biscuits must be served fresh out of the oven. I quite enjoyed the buttermilk cake version with whipped crème fraîche in individual portions so I made it again this year. Only this time, I wanted a showstopper. A tall and proud layer cake piled high with berries to mark Little Brother’s belated birthday celebration. I got what I asked for. Ever have that feeling when you’ve been away from the kitchen for so long that you may forget how to cook? My European travel only lasted less than two weeks but I certainly felt like it was longer. Friends old and new were so generous to show me the Old World I couldn’t have asked for a better vacation. I had never been to Germany prior to this trip. 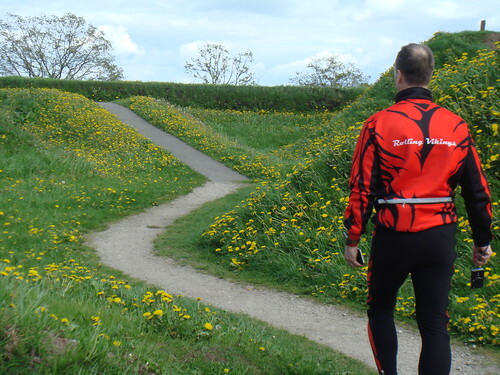 I got the chance to spend a weekend in Damp and a night in Husum/Nordstrand, both in the Schleswig-Holstein region near the German-Danish border. Obscure choices for a first-timer I’m sure but it was inline speed skating competitions that brought me there both times. The photo above really says it all. I took it immediately after I completed my race in Nordstrand of which I came third place overall among the women. 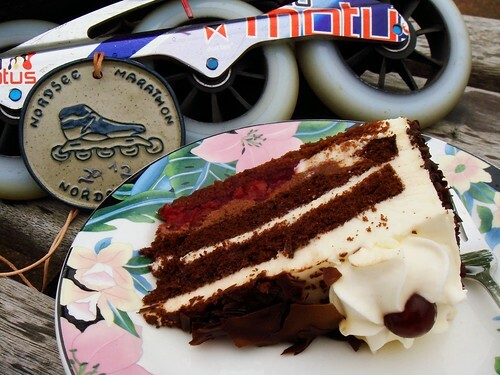 I skated a good race, received my medal, and rewarded myself with a slice of authentic black forest cake loaded with kirshwasser. It was as good as I hoped it would be. 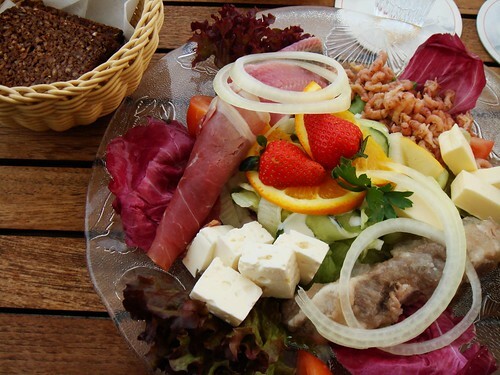 I am far less familiar with the German language or cuisine compared to other regions of Europe. This made for quite an adventure which I thoroughly enjoyed in my brief stay. The night before my race last Sunday, I ventured from the hotel to the waterfront neighbourhood in Husum. Being a quiet seaside resort town, the atmosphere was relaxed and welcoming. The lack of an English menu nor any English-speaking waitress did not deter me from enjoying my dinner. 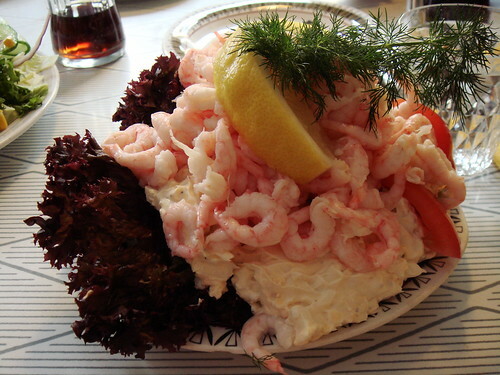 I ordered Friesenteller mit nordischen Spezialitaten: Matjesfilet, Nordseekrabben, Fetakase und Sauerfleisch, Holsteiner Schinken, dazu Brot und Butter and hoped for the best. I have a confession to make: I am a hoarder of baking chips. When I go to grocery stores in different cities, I make a beeline to the baking aisle to check out which baking chips are available. Obviously I have plentiful supply of everyday chocolate chips because you never know when the craving for chocolate chip cookies may strike. I also have a selection of fancy chocolate chips that I save for special occasions. But the fun begins when I go through my collection of novelty chips. White chocolate chips, milk chocolate chips, zebra chips with white and milk chocolate, butterscotch chips, peanut butter chips, mini chocolate peanut butter cups, toffee bits, Andes mint chocolate bits, cinnamon chips, the much-coveted mint green chips, and my latest find lemon chips. I love them all. I wanted to make something special with those pretty pastel lemon chips. I’m pretty sure my search would come up short if I look for recipes specifically calling for lemon chips. 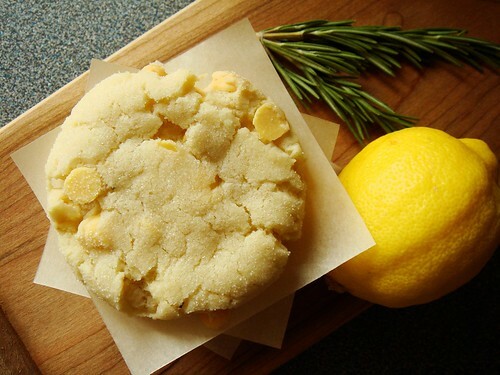 My inspiration began with lemon and rosemary, a classic flavour pairing. The butterscotch undertone of a classic chocolate chip cookie dough would overwhelm the fresh taste of lemon. However, I do enjoy the soft chewy texture of a big fat cookie loaded with chips. Recalling my success with America Test Kitchen’s Chewy Sugar Cookies last year, I set to work. I am in Germany right now at the cusp of a very important race. This time last week, I was at home preparing a bento to be hand delivered to Boyfriend for his birthday. As far as travel planning goes, this was not my brightest move. Over the course of a week, I went from Toronto—>Virginia—>Toronto—>Virginia—>Brussels—>Copenhagen—>Damp, Germany. Sometimes, a bit of legwork is necessary to be with someone I care about, to do something that means a lot to me. It all started when I had the notion to treat Boyfriend to a homemade lunch on his birthday. My plan was that I arrive in Virginia around lunch time and he would meet me at the airport over his lunch break. 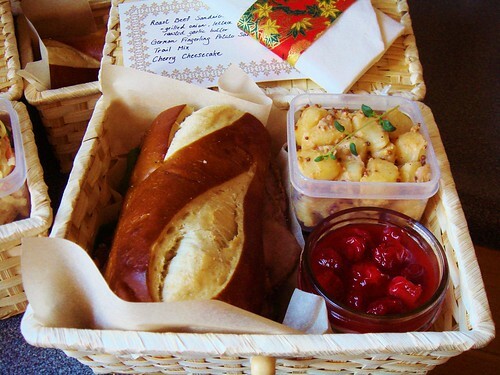 I meticulously prepared a sandwich bento that appealed to his meat-and-potato appetite. Packing bento and picnics is my specialty. To create this single-serving lunch, smart shopping is key. 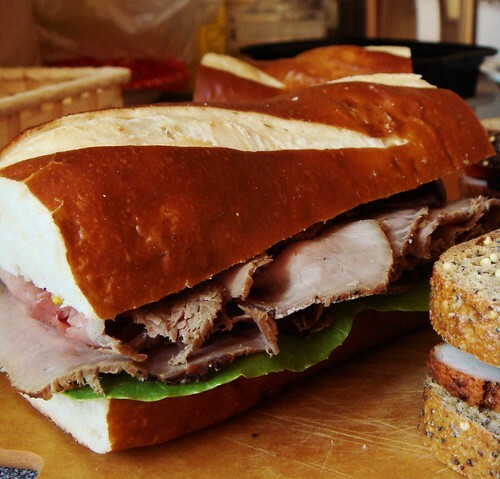 I purchased most of the ingredients from Whole Foods including the pretzel baguette and roast beef. As for the other ingredients, a well-stocked salad bar is my ally! I bought only as many greens, cut vegetables, and roasted garlic cloves as I would need. The garlic was mashed with softened butter to create the most luxurious garlic spread. The fat coated the bread and protected it from getting soggy. The German potato salad was a simple mix of boiled fingerling potatoes, grainy mustard, white wine vinegar, shallots, smoked paprika, and a touch of mayonnaise. My two-tablespoon size cookie scoop received a good workout last week. After months of hard work, I finally began tapering for World Masters Championship. I cut back on the volume of my training while keeping the intensity high. It is now time to rest so the body will be fresh on race day Sunday. Regular readers may recall that I was so tired the last few weeks that I barely had enough energy to feed myself. A side effect of tapering is that I return to my energetic self. All I wanted and all I did was bake, bake, bake! Plenty of cookies and cakes were made last week. Drop cookies that were conveniently shaped with my cookie scoop, in particular. The scoop was that I wanted to create a beautiful assortment of cookies for Boyfriend to enjoy when I visited him in Virginia over the weekend. Mission accomplished! But let me tell you, it was a labour of love. When you see a small box of cookie assortment, never under-estimate the amount of work involved. For every different cookie in the box, there is one whole batch that you cannot see. It is just as much work to make one cookie versus twenty. 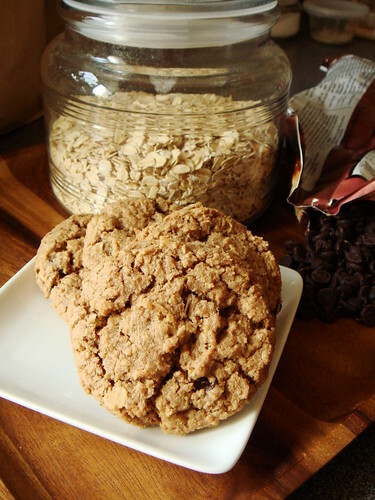 These textbook-perfect Oatmeal Chocolate Cookies were part of the mix.